The annual Muddy Puddles “Mess Fest” wasn’t created just because Ty wanted to jump in a muddy puddle. It’s also because Liam never had the chance to ride a zip line. It’s because when Brynlee had low immunity, she couldn’t go near anything “messy” and fun. It’s because when Riley was in the hospital he passed the time making goop, and because Jared would love to try the climbing wall but his treatment left him too weak. 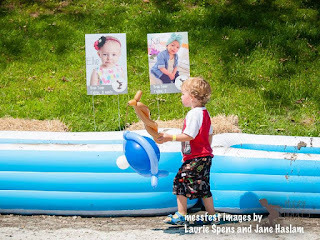 Every activity hosted at the Mess Fest is planned and executed with the children in mind. 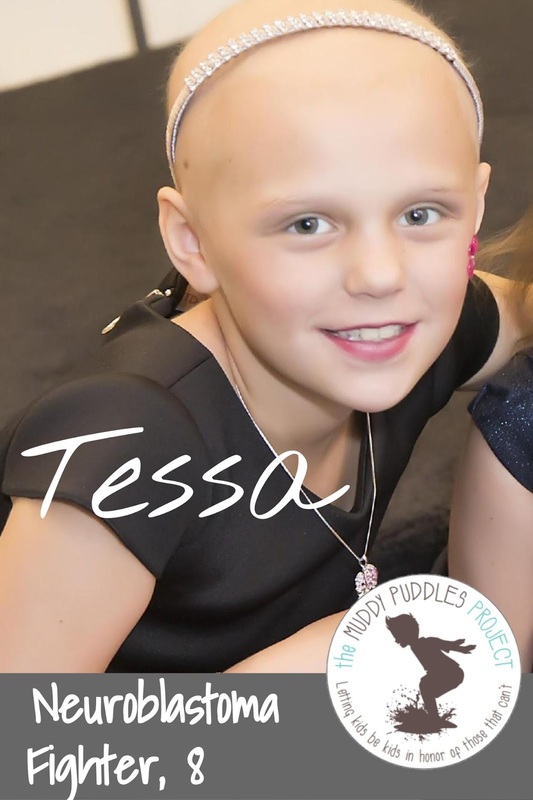 We dedicate each one in honor… or in memory… of a child that has been impacted by a cancer diagnosis. We do this because it is most important that everyone attending the event remembers how this event came to fruition, and the underlying reason why they are there. 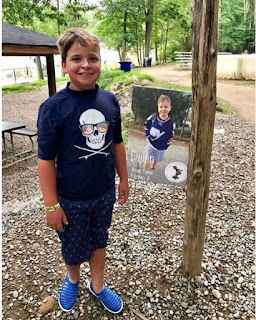 We make a sign for each child that includes a photo, age, type of cancer, and whether or not the child is a survivor, a fighter, or a forever child (for example, Ty passed away when he was five, so he is listed as “Forever 5.”). 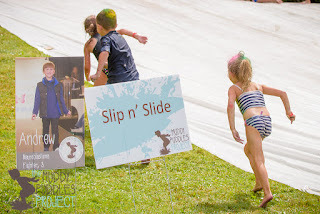 The TLC Board of Directors and the close-knit team of Mess Fest volunteers have all gotten to know the different children, even if just from having the hard-earned responsibility of handling the signs. We talk about them around the office when we hear updates on any one of our “kids,” and each and every sign is handled with our utmost loving care. The signs can get messy at the event, with mud splatters, food from the food fight, finger paint splashes, etc… and when we wipe them down we run a washcloth over the faces of these children as if they are our own kids needing a gentle but proper cleaning. Each year, we also have to inventory the signs and make updates. On one hand, we marvel at how much the kids have grown. For example, Dylan was 8 when we made his original sign. He has since had 3 more surgeries to remove new tumor growth and address infectious complications, yet he recently won the roller hockey championship in his league on Long Island and we will update his sign to read “12 years old” for next year’s event (he celebrated his 11th birthday at Mess Fest this year). He amazes us. On the other hand, some of the signs need to be updated to “forever’ signs, and those are the signs that break us. This year I had to make new signs for Brooke, Leslie, Ava, Trucker and more. I have to go into the file on my desk, delete the existing words and write “forever.” When the new signs arrive, I have to find the nerve to dispose of the previous signs without breaking down (which, is easier said than done). This year I struggled and cried when I came across Tessa’s sign just days before the event and realized her forever sign wouldn’t arrive in time. Questions like “Do I leave her sign down this year, cover the status, or leave it as is?” swam in my mind with tears forming in my eyes. I decided I simply couldn’t leave her out, but when I tried to cover up the word “fighter” I felt nauseated. So, I decided her beautiful sign would be proudly displayed as-is, and I would have an updated version for next year. Three years ago, there were two little girls in treatment for brain tumors and I followed their stories on social media religiously. Ellie and Kai. They were close in age to when my own son was diagnosed, and I relived every happy (and horrific) experience as they walked down a path I am all-too-familiar with. I admired how their moms were so active in their care, and progressive about treatment options. 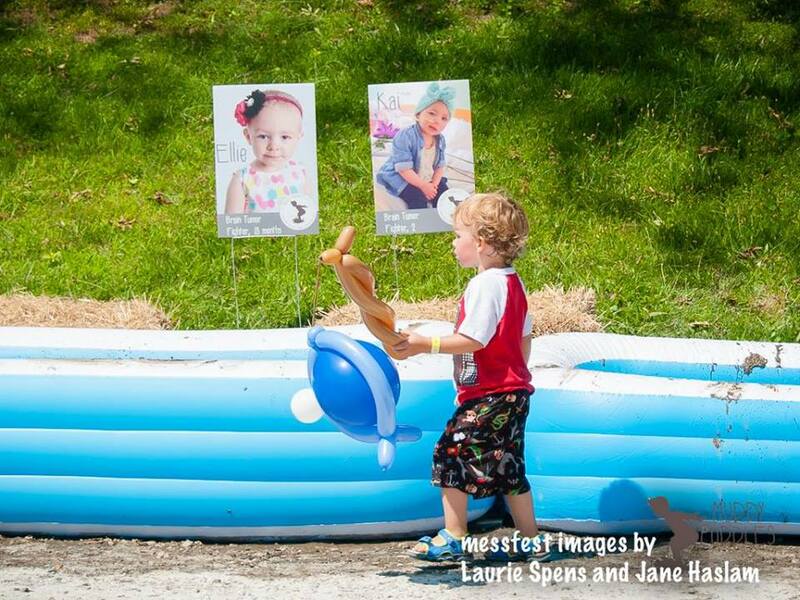 I hoped with all the hope in my heart that they would both thrive against cancer, and I couldn’t wait to dedicate an activity at Mess Fest in their honor. I got photos from their moms, and we agreed that it would be sweet to dedicate the same area to both girls because they knew one another from the hospital. I decided it would be absolutely adorable to envision them both in the mud kitchen, side-by-side making mud pies. And that is where their signs have been displayed ever since. This year, both Ellie and Kai were changed to “forever” signs. I beg of you, as parents, to remember the signs. Remember that there are so many children in treatment who can’t have the childhood they deserve. 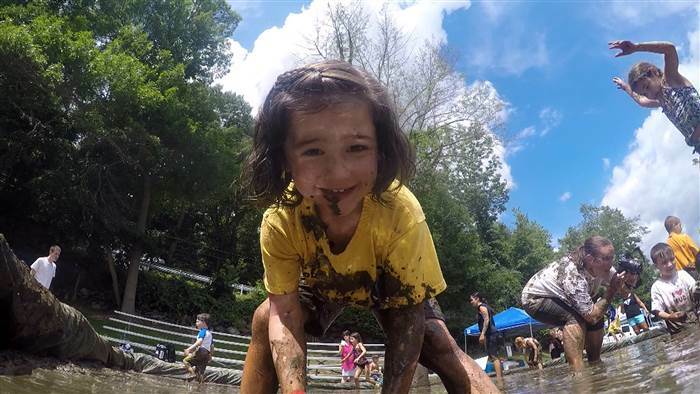 Let your kids get wild and messy sometimes, and take a step back to enjoy the moment yourself. Donate, because we can’t stop fighting for these kids until there is a cure. Share this blog and ask others to donate, too. How my heart explodes to see Gretchen and Addie playing in the mud kitchen in memory of Kai and Ellie.